ALLOWS TABLETOP GRILLS AND CAMPING STOVES TO USE STANDARD 20 LB REFILLABLE PROPANE TANKS RATHER THAN SMALL DISPOSABLE CANISTERS. ONE END OF THIS HOSE IS IDENTICAL TO THE GAS NOZZLE ON THE SMALL CANISTERS (1" OUTSIDE DIAMETER W/ EXTERNAL THREADING). 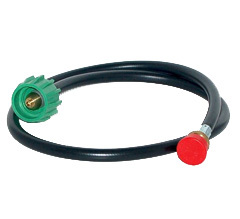 THE OTHER END OF THIS HOSE SCREWS DIRECTLY INTO THE 20 LB PROPANE TANK (NO REGULATOR REQUIRED). USA-Made Heat Plate, Stainless Steel | 17-1/4" x 4-15/16"
Sergio, thank you for your comment. It is true that some products we carry can be found cheaper on Amazon. We are a small, family-owned American business and have been serving our customers for over 10 years. We answer the phone if you have questions and we stand by our products' quality. We hope that is also worth something to you. Additionally, you can always ask us to do a price match. Sometimes we can't afford to but we will consider on a case-by-base basis. This product is really good but i found it much cheaper on Amazon.